Finally, we'd like to wish all of you a safe and happy holiday season. We would again like to thank everyone who participated in our recent Town Hall for your valuable input. We have received summaries from each of the session leaders and are reviewing everyone’s feedback. Going forward, we plan on constituting a leadership committee comprised of faculty members who can assist in shaping the direction of the Institute, including the identification of potential solutions to the challenges outlined in the session reports. Additionally, we are modifying and updating our website to become more useful. For Example, the Affiliated Core Facilities Page has been updated. Please stay tuned for more changes. The Purdue Lecture Hall Series, for local high school students to come hear current Purdue graduate students highlight their experiences and adventures in research, while also experiencing the university environment by meeting in different lecture halls throughout campus. We want to inspire the youth of today to consider life sciences as a career choice. Our next event will be Thursday, January 25th at 7:00 pm, this TED like talk will be by another PI4D Graduate Student Ambassador, Priya Prakash, Department of Chemistry and PULSe. Her talk will be "Neuro-Immune Interactions in Alzheimer's Disease". PI4D hosted a booth at the 2017 Chemical and Biological Defense Science & Technology Conference in Long Beach, CA, November 28-30. 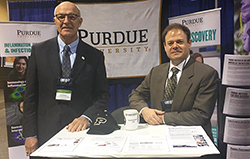 Several PI4D members attended the conference including Michael Ladisch, Jackie Linnes, Tamara Kinzer-Ursem, Katherine Clayton, Christina Ferreira, Carmen Gondhalekar (Paul Robinson's PhD candidate), Tommy Sors and retired Brigadier General Leon Robert, special advisor to PI4D. The group met and interacted with multiple military groups to start building relationships and identify areas for partnerships and research. Hello, PIIN community! As part of strategic effort to create awareness about the growing Brain and Spinal Cord Injury community on campus, and to foster relationships among researchers in this area, the Purdue Institute of Integrative Neuroscience (PIIN) inaugurated a Brain and Spinal Cord Injury Seminar Series in the Fall of 2017. We kicked off the first season of seminars with eight outstanding speakers from four different colleges at Purdue: Vet Med, Engineering, Science, and Pharmacy. Over 100 PIIN members attended one or more of the seminars. As such, this platform achieved its intended initial goal of community building. In addition to continuing the seminar series in the area of CNS injury, the PIIN leadership team is actively seeking to support additional inter-disciplinary research groups with common interests in emerging topics in neuroscience. To learn more about how PIIN will continue strengthening this initiative, please visit our news section. We would like to thank Dr. Riyi Shi, member of our leadership team, for leading this effort. Additional stories and highlights of our faculty and students are featured below. We wish you and your families a happy holiday season and a happy new year! Finally, a friendly reminder if you have something exciting, please share it with us at neuro@purdue.edu. PIIN is accepting applications for the Neuroscience Research Travel Awards to support graduate student travel to scientific meetings or workshops held February - June 2018. Deadline for submission is December 22, 2017. The Purdue University Center for Cancer Research (PCCR) was established as an NCI basic science cancer center in 1978. As such, the PCCR’s mission focuses on basic discovery - discovery that is the foundation through which the PCCR fosters innovative cancer solutions. Your membership and contributions are key to fighting the cancer problem! Please find updates below and you can always reference information on our Website. Up next in the Cancer Seminar Series, Dr. Danny Welch, professor and chair of the Department of Cancer Biology at the University of Kansas Medical Center, will be giving a talk titled “Cell Autonomous and non-cell-autonomous effects of mitochondrial DNA polymorphisms on cancer metastasis" at 11:30 am, Thursday, January 11th in the Drug Discovery Conference Room. Meeting starts at 1 PM on Monday, May 21 and ends at 12 PM on Wednesday, May 23.Visit our website for full details and important deadlines. 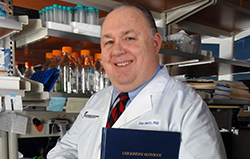 The Midwest Tumor Microenvironment Meeting brings together investigators from Midwestern universities broadly interested in topics related to the tumor microenvironment, including epithelial-stromal interactions, cell-matrix signaling, tumor immunology, and mechanobiology of the tumor microenvironment. Link to Calendars for Seminar, Internal and External Funding Opportunities and Events. This past week, the Regenstrief Center for Healthcare Engineering held a mini-retreat to consider three focus areas: Research to Impact, Strategic Engagements, and Building the Purdue Healthcare Advisors-RCHE Bridge. The event, which gathered faculty and staff associated with the Center and Purdue Healthcare Advisors, devoted time to defining goals and metrics in each of the focus areas as well as the resources necessary to achieve these goals. The conversations were quite productive, and we hope to have this event bi-annually. 2017 was a year of change for us; from welcoming a new Director, Dr. Paul Griffin, to defining new directions, to exciting research breakthroughs. We are looking forward to 2018, and continuing to advance the mission of the Center to transform healthcare delivery systems by conducting impactful research guided by national priorities. The Regenstrief Center for Healthcare Engineering’s faculty and staff wish you and yours a relaxing and safe holiday season and a happy new year.